Continuing their popular “STEM Behind…” series of classroom activities that feature interesting applications of mathematics and science with Texas Instruments technologies, TI has launched a new curriculum module, STEM Behind Sports. Previous modules in the series like STEM behind Hollywood feature the TI-Nspire CX, but STEM Behind Sports features the TI-84 Plus CE (review). Like other STEM Behind… activites, you can STEM Behind Sports can be downloaded from the Texas Instruments website. It includes printable worksheets in PDF and Word format, so it’s easy to add or omit content as you see fit. There are activities at the middle school, high school Geometry and Algebra II level. I downloaded the Algebra II activity from the TI website and uploaded the appropriate files to my TI-84 Plus CE. The activity focused on projectile motion using concepts like the separability of vertical and horizontal components of motion and simple parametric graphing. 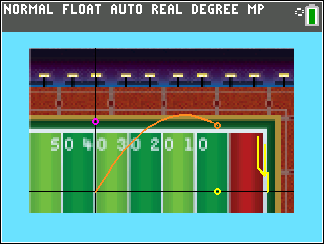 Students will especially enjoy the ability to “kick” their own field goals using the program TI has included with the activity. I love the idea of STEM Behind Sports because it has the potential to reach a very audience than previous STEM Behind… activities. Any high school math teacher (and really, any high school teacher) will tell you that there is a subset of students that is sport-obsessed but difficult to get interested in much else. STEM Behind Sports has the potential to reach those students with compelling mathematics problems.